Boulder, CO (PRWEB) Dec 1, 2010 - Boomerang is now offering their innovative Rigid and MasterSeries brand tire covers for the Jeep Wrangler in both painted-to-match and black-textured finishes. These high quality tire covers provide superior protection to rear-mounted spare tires from the harmful effects of sun and weather, while enhancing the vehicles’ rear profile. For more than fifteen years Boomerang has been manufacturing spare tire covers for Jeep, Land Rover, Toyota and Hummer vehicles. Boomerang Rigid covers are constructed of a molded ABS face plate sewn to a heavy-duty automotive grade vinyl band which covers the tread and secures the cover to the tire. 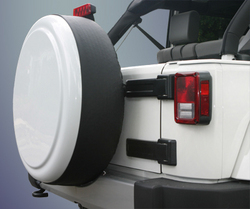 A cable lock kit is also available that secures both the cover and the tire to the spare tire carrier. MasterSeries tire covers are full hard covers that feature a painted-to-match ABS face plate and lockable stainless steel ring. The ring is available with either a polished stainless steel finish or a matte-black powder-coated finish. Boomerang Rigid and MasterSeries tire covers are currently available online from retailers including Amazon.com, Quadratec Jeep Essentials, Morris 4x4 and directly from the Boomerang Store. Black-textured Rigid and MasterSeries tire covers are available for all 1987-2012 Jeep Wranglers (YJ, TJ and JK). Painted-to-match Rigid and MasterSeries tire covers are currently offered in 2007-2012 Wrangler (JK) factory Jeep colors. For more information please visit http://www.boomeranginc.com, or contact Boomerang directly at (888) 521-6372. Boomerang Enterprises, Inc., located in Boulder, Colorado, was founded in 1995. The company is an ISO 9001 certified manufacturer of quality OEM and aftermarket automotive accessories.